You have never seen anything like it before! Imagine a dictionary that not only helps facilitate communication with others and translates anything you want, but now teaches you the language too! It's like having your own personal private tutor; the Language Teacher section speaks to you using fluent native-language voice narration giving you step by step instructions, quizzes, and pronunciation help so you can start speaking correctly in no time at all! 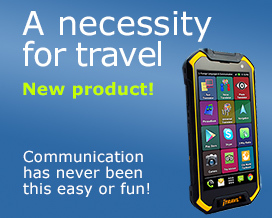 The revolutionary new ECTACO Partner EW800 is your all-purpose travel and language-learning companion in Western Europe. This addition to the ECTACO P800 series is an expandable, bi-directional English to/from German, French, Italian, Portuguese, Spanish dictionary and Travel Audio PhraseBook. It is our most powerful and efficient hand-held dictionary, quickly providing instant translations between English and 5 other Western European languages, yet easily expanded to incorporate more than 50 language combinations by adding additional MMC/SD cards. As with the other devices in this series, the EW800 presents a vast vocabulary database; in this case containing more than 2,500,000 words and phrases! Buy now and get an AC/DC adapter ($15 value) free! The revolutionary new ECTACO Partner EE800 is your all-purpose travel and language-learning companion in Eastern Europe. This latest addition to the ECTACO P800 series is an expandable, bi-directional English to/from Czech, German, Polish, Russian, Ukrainian dictionary and Travel Audio PhraseBook. It is our most powerful and efficient hand-held dictionary, quickly providing instant translations between English and 5 Eastern European languages, yet easily expanded to incorporate more than 50 language combinations by adding additional MMC/SD cards.